Please refer to our stock # 0665 when inquiring. 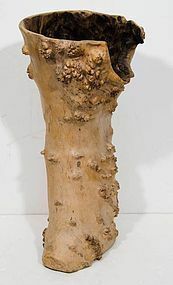 A Japanese Ikebana bleached willow wood flower arranging vase from the Meiji Period. This wonderful natural sculpture has a presence to offset the most traditional Ikebana arrangements. 21 inches (53 cm) high, 33 inches (84 cm) diameter.